Developing Dynamic Delts, Don Howorth’s Training Methods For Building Super Wide Shoulders! “Developing Dynamic Delts” My Favorite Super-Massive Exercises. 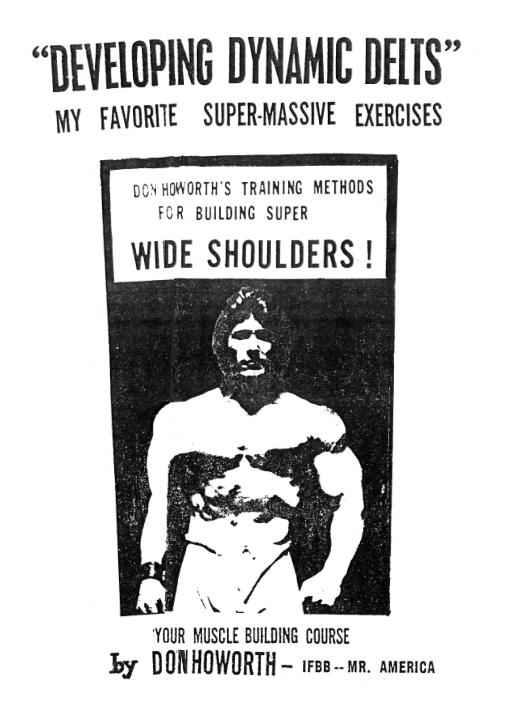 Don Howorth’s Training Methods For Building Super Wide Shoulders! Muscle Building Course by Don Howorth, IFBB Mr America. – Don Howorth history and how he went from 115 lbs to IFBB Mr. America! – Nutrition and Rest – Vitals! – What Should You Wear When You Train? – When Should You Take A Workout? – About How Many Exercises Should You Do? – Hows About Sets and Repetitions? – How About Strict Style and Cheating? – What Is Over-Training? Under-Training? – What About The Exercises? Any chance you will be getting this back in stock?